Enjoy your sample chapter of Slow Down to Speed Up! You’ll also receive your free PDF Slow Down to Speed Up: 36 Actions to Accelerate Success! As a bonus item, you will receive Liz on Leadership delivered straight to your inbox, giving you immediate access to my latest tools and advice. You may unsubscribe at any time — but I hope you will stay! 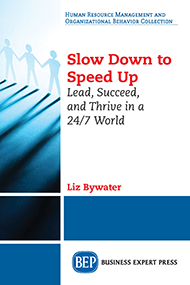 By checking this box you are giving Dr. Liz Bywater permission to send you a free chapter of her book "Slow Down to Speed Up" in PDF format. In addition you will receive monthly newsletters. You may unsubscribe at any time. I have worked with Liz and have greatly benefited from her advice and the tools she has developed over a long career of advising executives. I love having all those tools available in one book. Everything Liz says seems so logical, you find yourself saying, That Makes Sense! Liz creates a straightforward system to get you to “Stop”— to reflect, reprioritize, and create a vision for personal and career success. The stopping to accelerate, as Liz says, “to speed up”, has been invaluable in my own career. Liz provides an in depth look at something we all struggle with. Finding the balance. These real life examples provide insight into innovative new thinking around the pragmatism of finding high impact results in the middle of changing priorities and the constant search for overall effectiveness. Slowing down to speed up sounds like common sense. Why then do so many of us fail to execute on such a basic principle? Perhaps it is because we lack the tools that are necessary to make the process effective. Liz Bywater, Ph.D., provides guidance built on real-world examples, and incorporates instructive tools derived from her many years working as an executive advisor. If looking for a quick fix, this book is not for you. Because although Bywater’s work is a quick read, mastering the principle requires you to not just read, but reflect, engage, and slow down to get the most out of her advice.